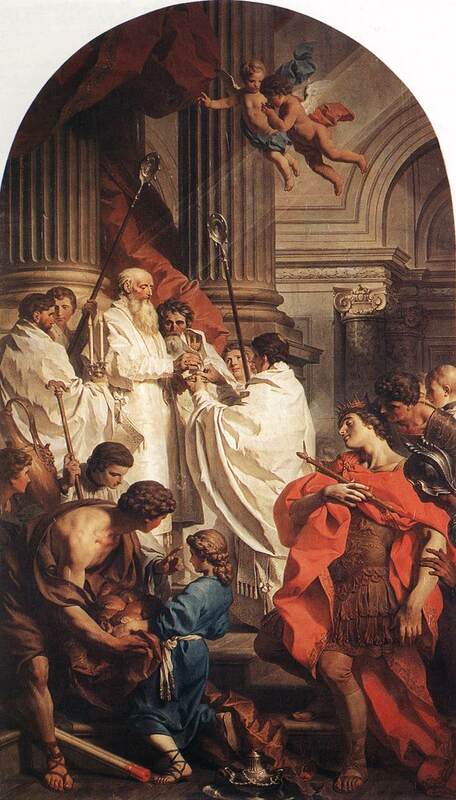 Jan 2 – St Basil the Great, (329-379 AD), Archbishop, Father & Doctor of the Church, St Gregory Nazianzus, (330-390 AD), Bishop, Doctor of the Church, …& the Holy Spirit!!!! | ADULT CATECHESIS & CHRISTIAN RELIGIOUS LITERACY IN THE ROMAN CATHOLIC TRADITION: hosting ONLY True Christians!! !, or "How to think Catholic!!" Jan 2 – St Basil the Great, (329-379 AD), Archbishop, Father & Doctor of the Church, St Gregory Nazianzus, (330-390 AD), Bishop, Doctor of the Church, …& the Holy Spirit!!!! –“The Mass of Saint Basil” by Pierre Subleyras (1699–1749). An altarpiece painted in 1743, and originally destined for Saint Peter’s in Rome, it is now in The Hermitage Museum in St. Petersburg. “Both St. Basil and St. Gregory were friends, both were born in the early fourth century, and both were schooled at Athens in rhetoric—a skill they taught for pay until they sold everything and entered monastic life in Pontus, Asia Minor. Both became bishops of important sees in the eastern part of the Roman Empire. Basil (the Great) was the ecclesial speaker and administrator, and Gregory of Nazianzus (the Theologian) was the poet and rhetorical mastermind, writing forty-five orations and over seventeen thousand lines of poetry. Along with many other theological works, both are known for their early and compelling arguments that the Holy Spirit is in fact God. Fourth-century views on the Holy Spirit were varied. Some pagans aware of Christian doctrine called the Spirit an external mind or activity that ordered the cosmos. Some who professed Christ’s divinity still contended with the Spirit’s divinity, thinking of him as a creature, lesser in honor than the Father and Son, but still worthy of respect. 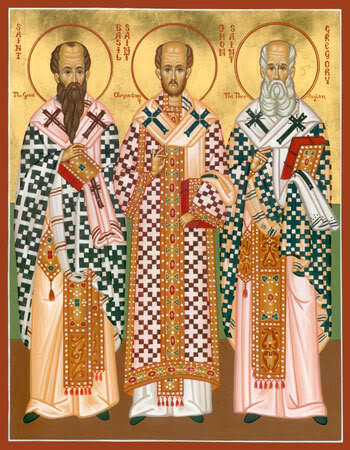 These latter Basil and Gregory called the Spirit-Fighters (pneumatomachoi), against whom they dedicated the weight of their talent by defending and explaining the Church’s teaching on the Holy Spirit’s divinity. In On the Holy Spirit, Basil argues, from the tradition of the Church and the baptismal formulation in Matthew’s Gospel, that the Holy Spirit is rightly counted with the Father and Son as God. Basil’s point is clear: we are saved by the regenerating waters of baptism, whereby we receive grace from the Father, Son, and Holy Spirit. This is a tradition that comes from Christ himself in his commission to the apostles to baptize “in the name of the Father, and of the Son, and of the Holy Spirit” (Mt. 28:19). Gregory of Nazianzus, in his fifth Theological Oration, reinforces Basil’s conclusion. Calling the Holy Spirit anything less than God only leaves us with further questions about our salvation. Man is called to worship the One who elevates and saves him, and this belongs to God alone. Since it is the Spirit in whom we worship and are baptized, failing to call the Spirit divine along with the Father and Son would detract from what belongs to God. Basil and Gregory realized that our worship of the Holy Spirit is tied to His role in creating and saving us. Something can only act from the way it exists. Therefore, if the Holy Spirit acts in our lives as God would do (namely, by creating and saving us), that is because He is God. In fact, any significant function belonging to God is also performed by the Holy Spirit. Scripture calls the Spirit the Sanctifier Who makes us holy, the Comforter Who widens our hearts, and the Advocate sent by the Son from the Father to teach us all things. He is called the “Spirit of God,” the “Spirit of Christ,” the “Spirit of the Lord,” and just simply “Lord,” to name a few titles. These are deeds and names that correspond to a divine Person, that is, one acting according to the same divine nature as that instantiated by the Father and the Son. To show this, Gregory of Nazianzus refers us to John’s Gospel, which recounts Christ’s telling of the Holy Spirit’s work and mission in the world: “But when the Counselor comes, Whom I shall send to you from the Father, even the Spirit of truth, Who proceeds from the Father, He will bear witness to Me” (Jn 15:26).